John has been married to his wife Lynn for 33 years and they have two children: Matthew and Joseph, along with one granddaughter, Harper. John and Lynn are part of Ryker’s Ridge Baptist Church in Madison where they both have active parts in the church. They both work at Hanover College, where John is the supervisor over the maintenance department. John has been active with the Boy Scouts: As a youth he earned the rank of Eagle, and as an adult leader he has participated since 1977. 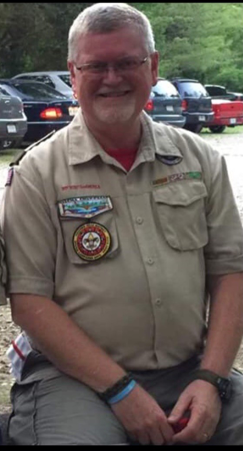 He is currently the scoutmaster of Troop 717 in Madison at First Baptist Church. "Since there were many people that took their time to help me as I grew up, I want to have that same impact on kids today!" He began coming to Southeastern Baptist Youth Camp in 1983. Since that time he has taken part in the life of the camp in several ways. He participated early on in Music camp, then several other camp sessions that include; Junior Camp for elementary age kids, Operation Equip for college kids, Family Camp, Wilderness camp, and He has enjoyed helping around the camp in many ways. John is the Dean for Wilderness Camp, which is in its fourth year. This is a weekend camping experience offered at Southeastern Baptist Youth Camp for those in 5th—9th grade. Wilderness Camp is a little different than most camp sessions. During the weekend, kids camp in tents as well as cook their own meals as a group and then spend time learning outdoor skills. They also spend time looking into the scriptures to see what God has to say to us through His word about things like what a Christian Worldview is and how to have a relationship with Christ. With the varied backgrounds kids and folks come from today, Church camp is a great place and way to share Christ with people!